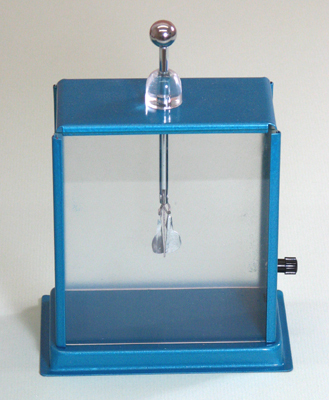 Big demonstration Electroscope, the whole class can see the deflection. Strong metal construction, 6 x 5 x 2.5 inch, total height 7.5 inch, with ball. Transparent removable front glass plate, translucent back plate so that repulsion can easily be observed. With terminal for earthing.